Update: You just need to use UnityEditor.Handles.GetMainGameViewSize() and don’t need any reflection at all (even though it still might be useful for something else). Thanks to Zanleo for posting an easier option in comments! The game that I’m currently developing should switch spritesheets for different device sizes. UD (Ultra HD) for iPad’s with retina. And I have a script that switches between them by detecting current device resolution. 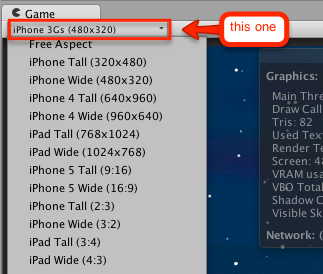 Everything works well when I test on device, but when I test from Unity editor the Screen class always returns resolution of my desktop display (1920×1080), no matter which value I set in the GameView. 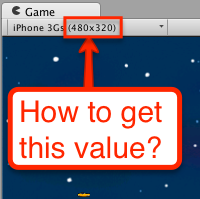 As you can see on the screenshot, I’ve set my resolution to iPhone 3Gs (480×320) and would like to get that resolution (480 x 320) in the code, so that I could test loading and switching between spritesheets. The code to take the game view I found in this answer. This way we can set the resolution we want to test in in the Unity Editor (e.g. 960×480 to make the code load iPhone 4 resources) and test that the code picks correct resources and adjusts everything just as if it was running on device with target resolution. Lovely! This is exactly what I was looking for. Thanks! Thanks a lot, I was looking for this everywhere! Great Solution! It helps me a lot to test Bundle download and screen size on my project! Thank you!